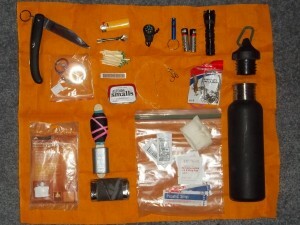 In my vehicle, I keep a small kit of just-in-case items that would help me to get home on foot in an emergency situation. This is known as a get-home-bag; or in this case, more of a kit. Everything here* fits into a 32oz aluminum bottle, which is handy to keep and carry, unobtrusive and discreet. It is cheap and easy to assemble, making it a good gift for loved ones. This kit is based on Dave Canterbury’s 10 C’s of Survival, plus a few additions of my own. This kit is not meant for long-term survival, but rather to provide options to stay alive and signal for rescue, or to facilitate 2-3 days of quick travel through wooded or urban environments to get home. I place my kit in the webbing of a 2L hydration pack, which gives extra water storage and a place to put all these items when I need to use the bottle (though the bandana can serve as a bindle.) I also keep a sealed gallon of distilled water with it in my trunk, for consumption or as an antifreeze substitute if necessary. There is also a quart of motor oil and a gallon of stabilized gasoline, primarily intended for vehicle emergencies, but with numerous survival uses. No perishables are included in this kit, as it is meant to withstand extreme temperatures and neglect within the aforementioned trunk. I’ve recently removed the “Uses” column from this list, and moved this information with more detail to a quick-and-dirty user’s guide. * I have replaced the pictured Cold Steel Kudu knife with a Gerber Moment, which does not fit inside the bottle. I feel better with the sturdier construction, and it also gives me the option to leave the knife behind and take this kit where knives aren’t permitted. If one were to use a Nalgene bottle to contain this kit, one could include a steel cup that will fit over the outside.